Corporate and Promotional Christmas cards to suit all tastes. can be personalised with your full corporate details. 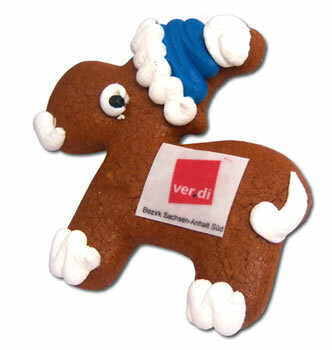 Christmas Gingerbread reindeer decorated with icing sugar, individually wrapped in mini transparent bag. Personalised with your company details. Minimum Order: 200. Shelf Life: 6 months. Please contact us for price details and personalisation options. Promotional Choice Ltd., Chambers Business Centre, Chapel Road, Hollinwood, Oldham, Greater Manchester, OL8 4QQ. United Kingdom. © 2000 - 2012 Promotional Choice Ltd - all rights reserved.